At the beginning of the Industrial Revolution as the demand for coal started to rise and it became necessary to start mining for coal underground. The miners quickly ran into the problem of flooding. 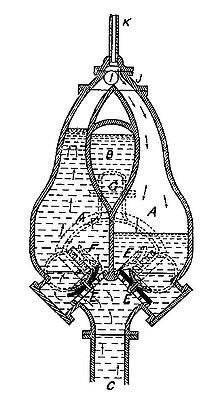 a device able to lift water a height of 25 feet out of flooded coal mines by the ‘impellent force of fire’. The Pulsometer pump is a direct descendent of Thomas Savery’s brilliant concept. In 1872 a British engineer purchased the patent for the pulsometer pump from an american Charles Henry Hall and went on to found the Pulsometer Engineering Company in Reading. The pump body is made of cast iron with three chambers. It only has one moving part, a small brass ball, which allows steam to enter each of the outer chambers alternately and two leather flap valves to control the direction of water flow. once started it would run continuously without the need of an attendant. It was able to pump almost anything from the most contaminated water down to thick liquid mud. It found very wide use in quarries and mines and a host of other applications in industry. Our pump was built in 1880 and came from a London hotel where it was used to pump water out of the basement until the late 1930’s. Visitors can see this pump running on our steam days.